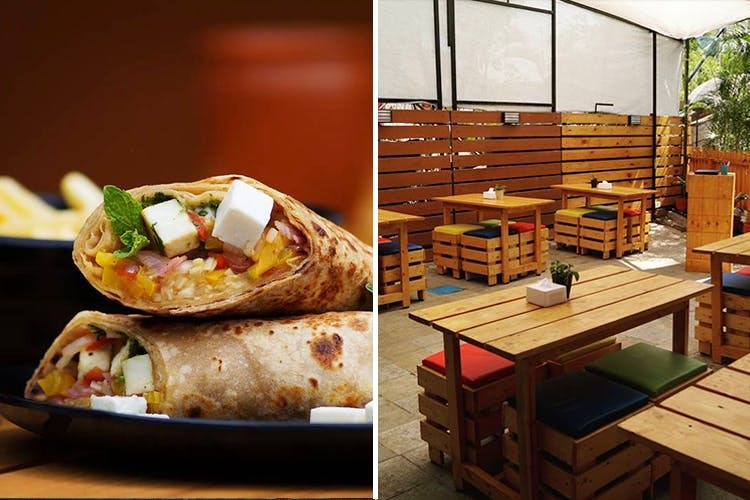 The Grub Hub is a charming little cafe we stumbled upon in Baner and its extensive breakfast menu will blow your mind. Located right next to Axis Bank in Baner, The Grub Hub is a fairly new player amongst the restaurants in Baner. The place is quite colourful and quaint in its own ways. Expect an al fresco setting with wooden chairs and tables, multi-colour cushions that look like Rubik’s cube, potted plants on the side and so much more. The menu, on the other hand, is simple yet has our kind of comfort food. From scrumptious combo meals to cheesy chicken sandwiches, curries and paranthas, they’ve got it all. What impressed us the most was their breakfast menu. We recommend you try their butter omelette with toast, egg bhurji sandwich and hot chocolate. Over and above the breakfast menu, you can definitely try their mouthwatering North Indian spread comprising everything from belly-filling Punjabi paranthas, veg handi, pahadi aloo tikki, mutton kheema and even, chicken biryani. The Grub Hub is a kind-of neighbourhood cafe where you can spend hours over good food and great conversations.